Cheffins Cambridge Vintage Sale at Sutton, near Ely on the 15th October 2016 will showcase a number of the world’s most unusual classic cars, motorcycles, tractors and steam engines, available to purchase at auction. The Ruston, Proctor Lincoln Imp Steam Tractor is one of only six known to exist in the world and is named ‘Lucifer.’ It was completed at Sheaf Iron Works, Lincoln, in November 1918. It was retained for a short period by Rustons as their works engine, before being sent to the Isle of Man, where it worked on the docks. ‘Lucifer’ was bought for preservation in the 1950’s by a Mr Wells in Lincolnshire who fully restored the machine. The engine has since had two other owners and is now coming to the sale with a guide price of £115,000 – £130,000. 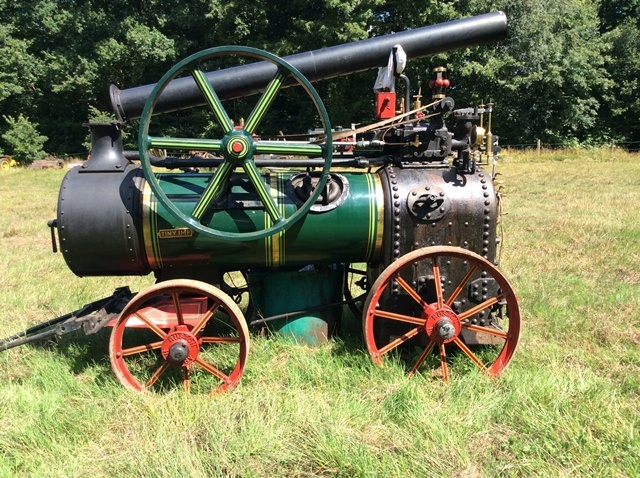 The star of the show for the tractor section will be an incredibly rare Holt 75, dating back to 1914. This iconic model was built in Peoria, Illinois, sometime from 1914-1924, and is one of only four examples known to exist in the UK. The machines were initially built as military tractors and supplied to the British, French, Russian and US armies during WW1. This specimen in particular was originally part of the famous Heidrick Tractor Collection, part of the California Agriculture Museum and is thought to have been built in 1917 to military specifications. It was purchased by the current vendor in 2003 and shipped to the UK, it is coming to the sale with a guide price of £50,000 – £70,000. Also on offer will be a number of desirable classic cars and motorcycles. The key lot for this section will be the incredibly rare 1907 Rover 6 which has a guide price of £24,000 – £26,000. It was built in 1907 and first restored in the 1950s, and since has been authenticated by the Veteran Car Club. After some time little was known about the car until it was restored for a second time in the 1990s. The Rover 6 was designed by Edmund Lewis from Daimler for Rover cars in 1904 and is smaller than the previous Rover 8 design. It is powered by a 780cc single-cylinder engine and the model was only the second car to be built by the Rover company. It was advertised as ‘the most reliable and cheapest car in the world – even a lady can drive it,’ when it was first brought into production. Jeremy Curzon, Director at Cheffins Vintage Machinery sales comments: “On a warm sunny day, this car really is Edwardian motoring at its best. There are a few known examples in this condition and we expect it to be hugely popular at our next auction. This particular car has been painted British Racing Green and has cream coloured leather upholstery, it cruises comfortably at 20mph and is perfect for someone looking for a perfectly restored addition to their classic car collection.” Of the motorcycles on offer, an unusual 1931 1200cc Harley Davidson with a fibre-glass replica Swallow sidecar which has only travelled 200 miles since its rebuild is set to generate the most interest. Other key lots will be a number of rural and domestic bygone items from the Holkham Hall Bygones Museum. These include a number of interesting glass negatives, a good selection of Edwardian camera equipment and an ex-Anglia TV studio camera on its steerable dolly, dating back to the 1960s. These items are being sold following the closure of the Holkham Hall Bygones Museum, which is being replaced by a new permanent, interactive farming exhibition, ‘Field to Fork’, at the Holkham Hall Estate.